When you’re buying a canoe there are a few different types you can choose from, with each one being designed for a particular purpose or activity. There are also various different materials you can choose from. So if you torn between choosing an aluminum vs fiberglass canoe then we’re here to help guide to which one might suit your needs better. Let’s look at the advantages and disadvantages of both and what each one might be used for. Fiberglass canoes are generally made from mixing fibers and resins and leaving them to form within a mold. They are often extremely durable and very lightweight. The surface of the hull is often coated in a smooth gel, which gives the canoe added resistance to knocks and scrapes. Because fiberglass crafts are made in molds they can be, in effect, molded to any shape or design, with many of them tending to be built for speed and efficiency on the water. One of the design features that can be common on fiberglass canoes is the more pointed shape of the bow and stern, the entry lines (and exit). A more blunt entry line may be better for stability over waves. Fiberglass is one of the most commonly used materials in canoe manufacturing, probably because of the ability to create various hull shapes and designs to improve the performance of the vessel for a particular activity. This means you will often find fiberglass crafts built for everything from whitewater to flatwater. Another thing about a fiberglass vessel is that if you do happen to damage it, it can be pretty repaired pretty easily with a patch repair kit. 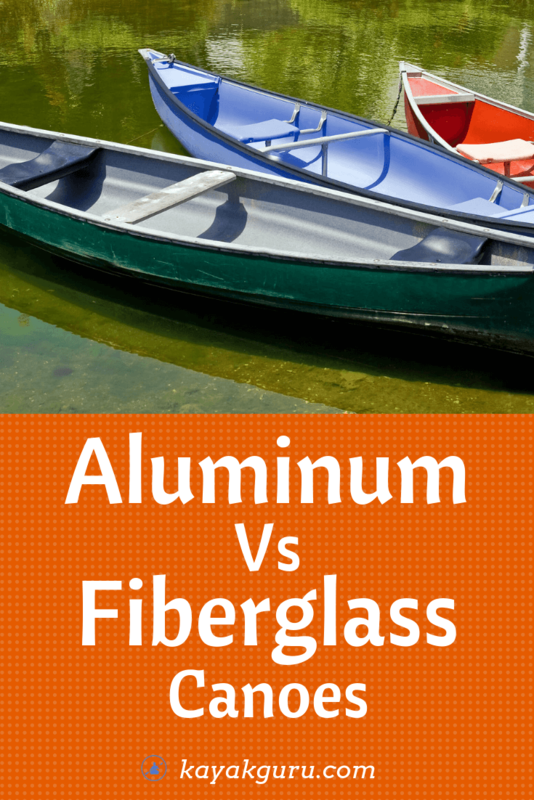 Aluminum is probably one of the most durable materials when it comes to canoes. It can take a lot of knocks and bumps, which can be ideal in a recreational vessel, especially if kids or beginners are using it. While it can survive a few bumps against rocks, you might be left with a dent in the hull, which probably won’t go away. However, this should often have a minimal impact on its performance on the water. If you do need to repair a hole in the hull, you’ll probably find that it requires welding by a professional. And because of the metal material, you’ll probably be able to see the repair job. Aluminum canoes are also resistant to UV light and extreme temperature damage, so they can be left outside with little issue. Even though they won’t suffer damage in the heat or cold, they can become particularly hot in the sun, which may be uncomfortable if you have to sit in one, or even lift or touch one at all. While aluminum vessels can be great for recreational and occasional use, they can often be less efficient in the water when it comes to speed. This is because of the way that they’re manufactured - riveting two sheets of metal together along the inside of the keel. Unlike the fiberglass canoes, that are crafted from a mold, the aluminum ones can often lack the performance driven designs. Aluminum crafts will tend to be heavier to lift and slower on the water, so may not be great if you’re looking for the fastest way to get across the water. Similarly, if you have to carry it a distance to get to or from the water, then it might be a struggle if you’re on your own. Aluminum and fiberglass canoes can both be very durable and can be equally suited to recreation. If you’re looking for more of a performance driven craft, you’ll probably have decided that a fiberglass one might be better suited to you. On the other hand, if you’re simply looking for a tough vessel that requires little maintenance, that you can take out on flatwater for fishing or family paddling trips, an aluminum craft could work out better for you. Now that you know the pros and cons of both, it’s down to personal preference. Whatever you choose, let us know how you get on, or tell us what canoe material you prefer. And if you know anyone who might enjoy reading this, go ahead and share it with them.